With more than 40 vendors, the Jack London Square Farmers Market offers local produce, food craft products, and breakfast and lunch options. 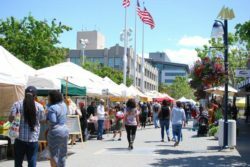 The Jack London Square Farmers Market is operated by CUESA at Oakland’s Jack London Square on Sundays from 10 am to 3 pm, year round, rain or shine. Founded in 1989, the Jack London Square Farmers Market has deep roots in Oakland, providing a vibrant waterfront marketplace of local farms, food crafters, and restaurants for Bay Area families. On most Sunday, free cooking demos take place at the CUESA Classroom (adjacent to the info booth at Broadway & Water Street) and are free to the public, with recipes and samples for all.